Big Top Liquors, one of the retail legacies of venerable grocer Sid Applebaum, has a new home. The family-owned business now occupies the building that housed the former Perkins Restaurant & Bakery at 1544 University Ave. in St. Paul’s Midway neighborhood. Company owners recently held a ribbon-cutting ceremony to mark their new 6,000 square-foot site, a relocation necessitated due to construction of St. Paul’s new major league soccer stadium, Allianz Field. At the ceremony, co-owner Jay Applebaum told local dignitaries that Big Top “was started by my father [the late Sid Applebaum] almost 40 years ago.” The store’s temporary home is smaller than its previous 16,000 square footprint, he said. Because of heightened competition in the retail industry, “we need to be more efficient,” Jay Applebaum said. Currently, Big Top Liquors carries about 500 different kinds of beer, 8,000 liquors and 1,000 varieties of wine. The Applebaum family has had a retail presence at the intersection of Snelling and University avenues for more than 60 years, according to Nancy Rosenberg, co-owner and Jay Applebaum’s sister. “We are very proud of turning a decaying Perkins location into a temporary liquor store that is attractive, hip, urban, fun…for our neighbors,” Rosenberg said. Despite many changes at the University and Snelling avenue intersection_ including a revamped roadway to accommodate the light rail transit “green line_ “we have survived,” Rosenberg said. 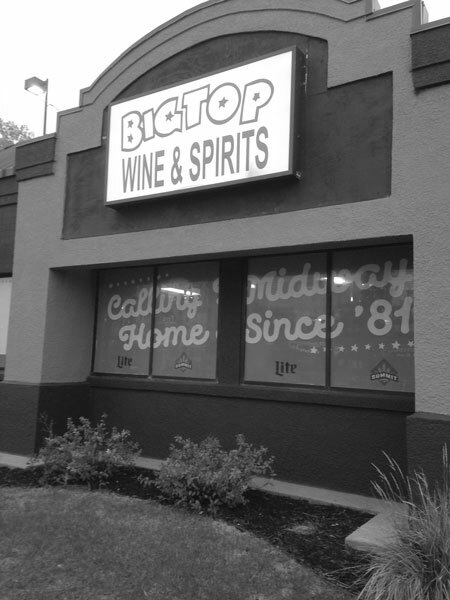 New promotions and marketing have contributed to Big Top Liquors’ longevity. Meanwhile, Big Top Liquors has collaborated with community programs and activities, such as an art-based event in which Big Top features local craft beers and local artists create art in real time, Rosenberg said. Rosenberg and Jay Applebaum anticipate Big Top Liquors will occupy its temporary space for up to three years before it finds a permanent home near its old Midway district location.